Crafted To Bloom is LIVE! After several weeks of tinkering around with ProPhoto Blog, my new website & blog, Crafted To Bloom, is now LIVE! Obviously, if you are reading this post, you will have noticed the new layout of the website & blog. It is much more “me” than the previous layout and I just *adore* how I can incorporate floral details throughout for consistency. Gallery Page – Images of flowers & arrangements for weddings, baby showers, home decor etc. I am still adding more images, as I have a ton in my hard drive that I had shot for the blog, but did not end up using. Journal Page – Postings for my blog. You can read archived postings under “Updates” and “Tutorials”, however, I have removed direct links to any other previous posts that do not involve paper flowers. Those posts can still be accessed via their URL or through Pins on Pinterest. Contact Page – Email me for any questions or inquiries regarding commissions and custom orders. At the present time, the URL for my website & blog remains the same (www.craftedsophistication.com). I am considering changing it to reflect the new name of my blog, however, I’m cognizant of the fact that much of the traffic to this site is via Pinterest, and changing a Pin’s URL does not automatically change a Pin on someone else’s Pinterest Board. I have also continued to incorporate Social Share Icons for Facebook, Pinterest, and Instagram, below each blog posting, and Pin-It buttons on the image to make it easier for you to Pin an image. I would absolutely love any feedback you have of this new layout! As some of you are already aware, I used the ProPhoto Blog Theme in WordPress to create this new website & blog, and it’s been such a joy to use. For someone who loves customization and is particular about details, ProPhoto Blog has not yet failed me. I also love using fonts & graphics from DesignCuts. If you are into graphic arts or you just enjoy using different fonts, DesignCuts offers packages of fonts & graphics at ridiculously reasonable prices. Again, thank you so very much for continuing to follow my blog, my work, and my passion. I am humbled by your kind comments and thankful for your constant interest. Have a great weekend! 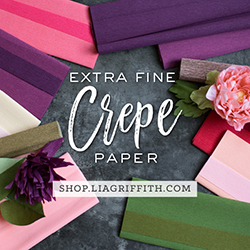 Next week I will be reviewing Lia Griffith’s new crepe paper line…I can’t wait to get back to making paper flowers.